This afternoon I jumped on the push-bike and rode down to Galgabba Point to take some photos. I wandered around the tracks near the sheds. 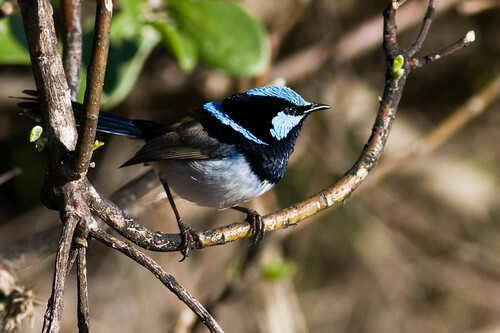 There were quite a few Superb Fairy-wrens, as well as some Grey Fantails hopping around. Up in the trees the honeyeater were having lots of fights and chasing each other around the leaves and branches of the flowering trees. 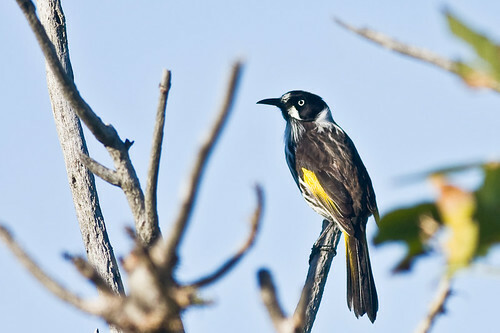 There were Blue-faced Honeyeaters, New Holland Honeyeaters, Yellow-faced Honeyeaters and Lewin’s Honeyeaters. 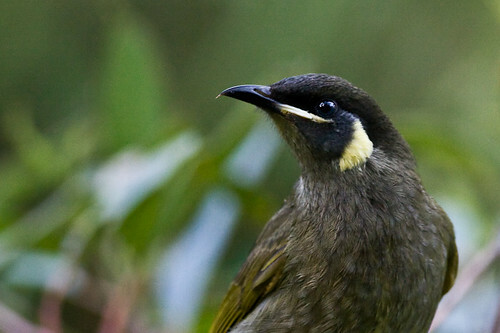 Lewin’s Honeyeater do not seem to jump around as frantically as the rest of the honeyeaters so they are a bit easier to take a photo of. This one sat quietly near me for a little while so I managed to get this photo at least. Near the houses there were Noisy Miners and a Black-faced Cuckoo-shrike looking down from the wires above. Going down the track towards the point, there were quite a few different birds chasing each other around near the Bell Miner colony. The Satin Bowerbirds were scolding away, the Noisy Friarbirds were chasing anything that came near their tree and a kookaburra sat on a branch just calmly taking it all in. An Eastern Spinebill was flying into a water hole and scooping a drink on the wing. On the creek, a couple of Little Pied Cormorants and a Little Black Cormorant sat nonchalantly until I came along. I have been noticing some really interesting fungi around the area, so I have been taking some photos of them the last few days. This one was a pretty standard looking one, with some interesting texture on the cap and in the background. It was very dark so I had to use the onboard flash , making the photo a bit orange, so in post-processing I set the white balance to Shade mode. This fungus had a weird crinkly shape and was right next to the creek. I have been doing some volunteer work at Galgabba Point this week. 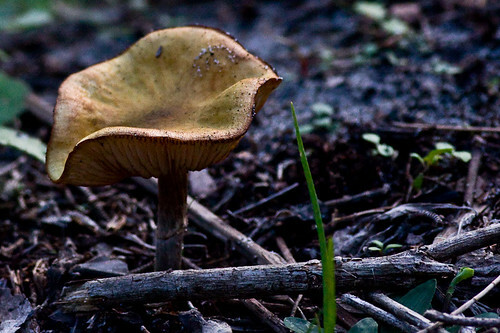 This morning on my walk I took some photos of some of the fungi that I found. 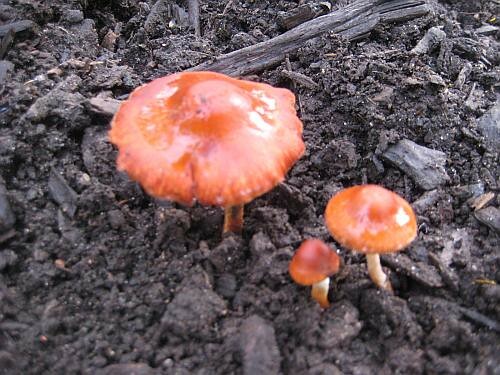 I have no idea what their names are or even how to go about indentifying fungus. 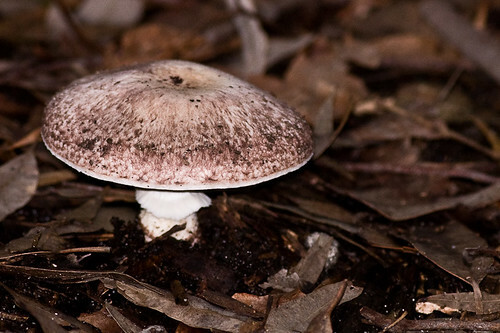 If you know any the fungus shown in the photos, please let me know. This fungus was in the compost heap. I found it when I was going for a little walk. It is strange how red it is. I could not believe this star-shaped fungus. It looks really weird. It was on the way out to the point. It could be called a Starfish fungus, but not sure yet. 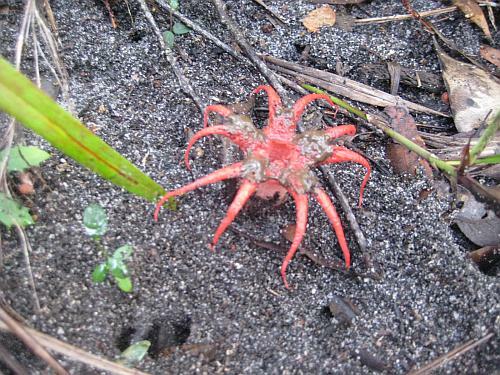 Edit: Yes it is a Starfish Fungus, thanks to Dennis who has written about them on his site. Also, Gaye from the Hunter has written about them on her blog. In the afternoon I got on the bike and rode up and down the exhausting hills to the start of the Wallarah Peninsula Community Walk. It goes from the end of the houses up to Pinneys Beach and beyond. In the suburban streets on the way I spotted Scaly-breasted Lorikeets, Black-faced Cuckoo-shrike, Noisy Miners and Laughing Kookaburras. There were not a lot of birds along the edges of the cliffs, but the scenery was fantastic. From the top of the cliff you can see all the way to Nelson’s Bay. There were a few small birds like thornbills and fairy-wrens but not much else. 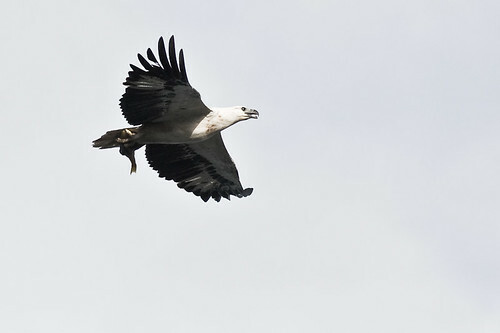 On the way back I spotted this White-bellied Sea-eagle coming back from fishing out at sea with a fish. There were quite a few Superb Fairy-wrens twittering around in the bushes. This male was showing off his plumage to me and his harem of ladies. 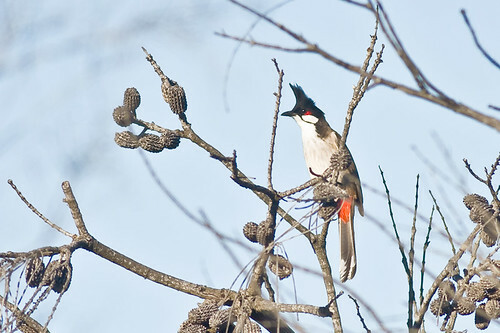 Further on I got the shock of my life when I got my lens on a Red-whiskered Bulbul. I had never seen one of these before so it is a big tick. I did not expect to see one of these around here. 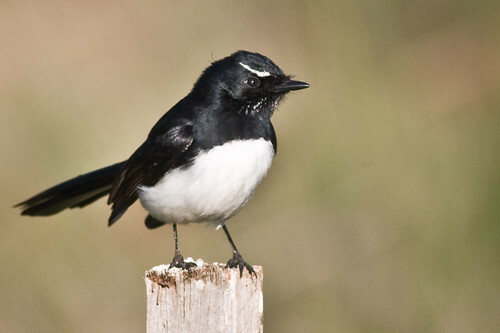 They have a black bill and a distinctive red tuft behind the ear, and a pointed vertical crest. The undertail coverts are red with a white-tipped tail. There were a few Welcome Swallow flying over the cliffs as well as some Red-browed Finch near a little creek that ran into the sea. I dipped down into the track to Spoon Rocks and there is quite a nice little beach there. Past the breakwater I climbed the old road that was used to make the breakwater and got to the start of the Wallarah Coastal Community Walk which goes further on to Pinney’s Beach. I might do that section of the walk another day. It looks quite a spectacular walk so I am looking forward to it. I had not been out for a while, so this afternoon I went down to Swansea Channel to take some photos of the birds. Lake Macquarie drains out to the sea along the Swansea Channel. I drove as far as I could along the southern side of the channel to the nature reserve. There were a few Silver Gulls, pelicans and White-faced Heron hanging out around the boat ramp. I went for a walk along the reserve but I could not get very far because the tide was full and it flooded the track. On the way back this Willy Wagtail came pretty close and had a good look at me. After that, I went along the road to the point and had a look on the lake side of Swansea. An Osprey flew past with a whole bunch of Galahs which was relatively bizarre. I waited around for the Osprey to come back but he didn’t. 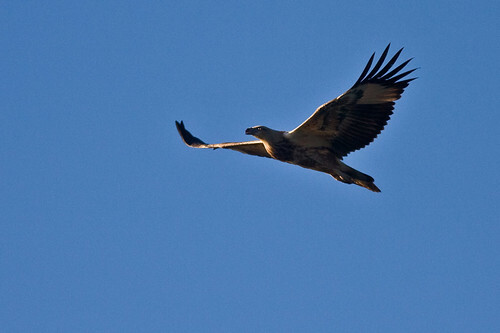 Instead this juvenile White-bellied Sea-eagle came flying around the point. I think this one is very young as the colours are very cryptic. As usual there were plenty of Black Swans and pelicans out in the lake. 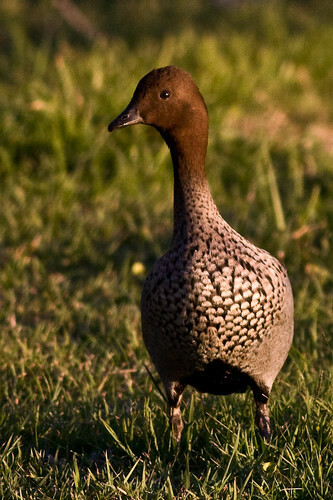 Noisy Miners were flying around the edges of the lake and a pair of Australian Wood Duck were feeding on the grass.